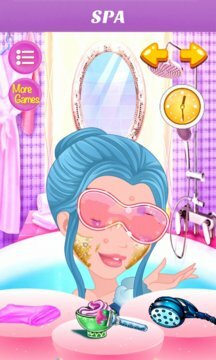 In this fantastic makeover game - Pretty Jce Princess Makeover, you are going to meet princess and give her a makeover. We have created a beautiful and pleasant makeup room for princess. In that room, you will find all the items that are needed for giving a fantastic makeover. All her facial care products are created only using fruits, flowers and herbs because Barbie loves to use the facial products made using natural ingredients. The natural skin care products that we have created will definitely make her face shiny. The makeup items, outfits and accessories we have here are carefully created by our makeup artist, fashion designers and many other fashion experts. Are you ready to give your friend, princess a cool makeover? Oh! I have a date tonight! Me and my boyfriend will be celebrating the Valentine's Day tonight with a perfect dinner. So I should look like a princess! Well, I need to start with makeup; then can you help me pick my dress? Thank you so much! Click through the makeover options to start working on her makeup and her clothes. ﻿It's a game for girls and kids. Here, countless festival themes are offered on purpose, such as beautiful monsters, fashion girls, Princess wedding, hot officce ladys, cute barbie and sweet students. Hair style, eyeliner, lip gloss, dress up, dentists and many other girl things you can do. Use makeup tools to achieve the perfect look for a party. You can choose a beautiful skin tone, change your hair style or color, make over the face and eyes, dress up your prettiest clothes, add jewelry and accessories. Now you are the awesome super star. Enjoy the fun game!